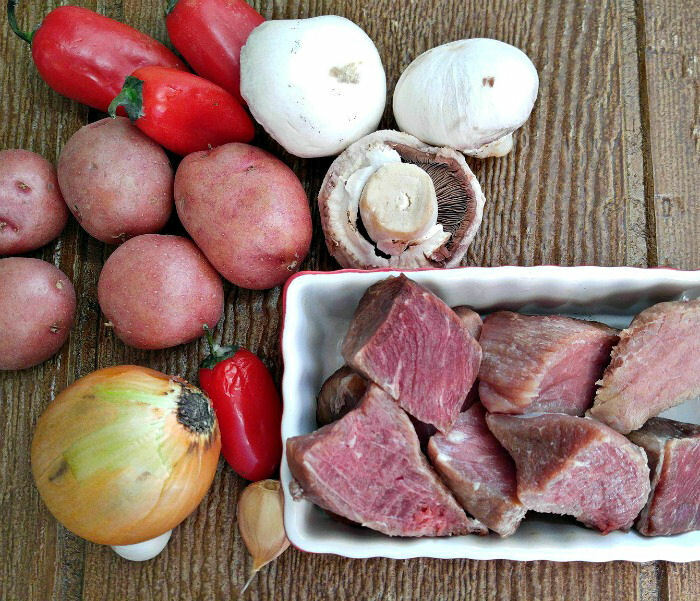 This easy beef goulash is a hearty one pot Whole30 Beef stew that combines cubes of beef with red bell peppers, sliced mushrooms and onions. The flavors in the goulash are deliciously coated and seasoned with a rich paprika tomato sauce. This is one of my favorite comfort food Whole30 recipes that is perfect for a cold winter’s night. One of the best things about this meal is that it comes together in one pot, adding layer upon layer of flavor. See my one pot cooking tips to make sure that yours are successful every time. I love one pot meals. Clean up is so easy after the meal is cooked, and the flavors seem to combine beautifully when the food is cooked layer after layer in the one pan. Check out my one pot jambalaya recipes for a really tasty dish. 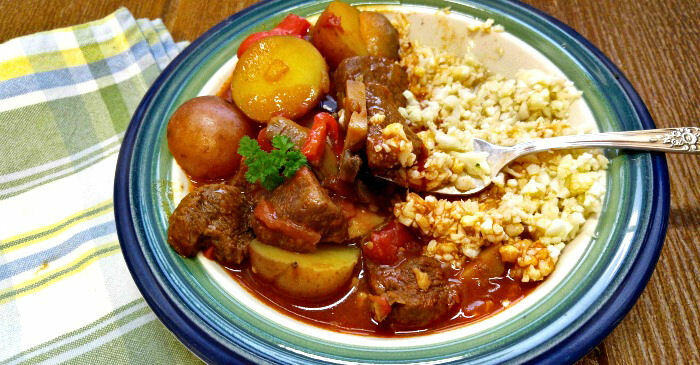 Goulash recipes began as humble beef stews for herdsmen in early Hungary. 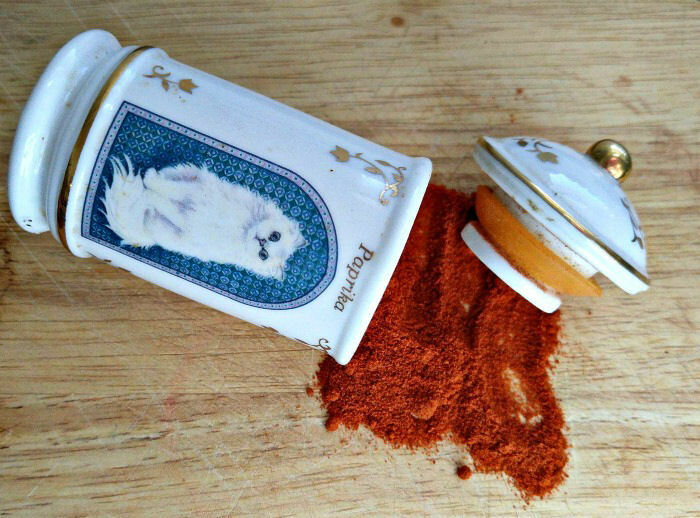 The style has evolved over the years but one main component always seems to be present – paprika. You can use either hot or sweet paprika for this recipe, depending on how spicy you like your food. If you can find Hungarian paprika, the dish will be even better! Meat and potato meals were a staple in my house growing up. I came from a large family and the food had to be stretched so stews were commonly served. I still enjoy cooking an old fashioned beef stew but find that more and more vegetables and spices seem to end up in my recipes the more I experiment. My husband loves sweet peppers, so this recipe is a popular one with him. 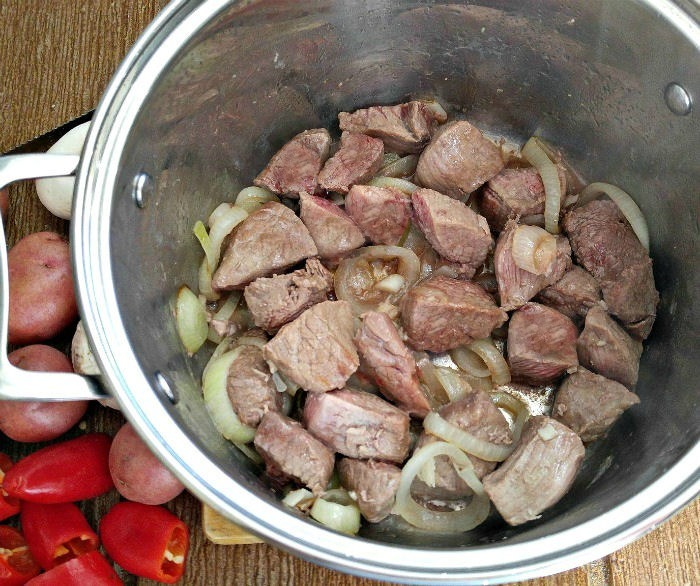 I started by cooking my onions in a large stock pot and then added the cubes of beef and garlic. I cooked them until the onions were soft and translucent and the beef started to brown. Lots of paprika went into the pan with a can of diced tomatoes, some tomato paste and salt and pepper. 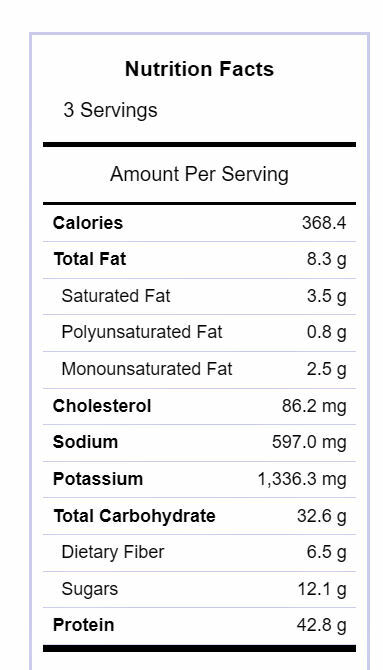 (be sure to check your labels for no added sugar if you are following the Whole30 diet. 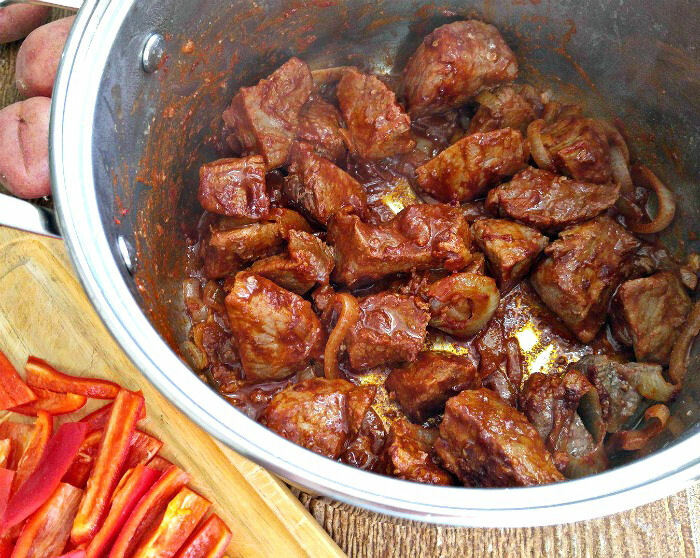 I love the deep rich red color that this easy beef goulash is starting to take on. The paprika also gives the dish a nice smokey flavor. 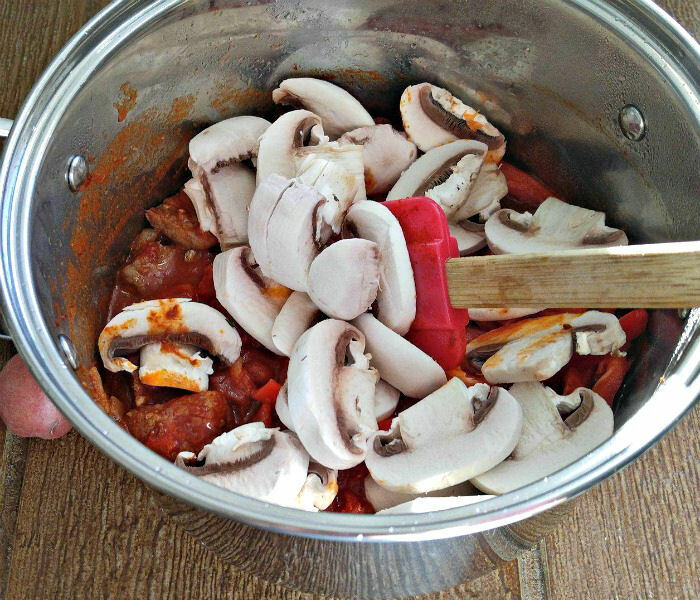 In go the sliced mushrooms and red peppers for a lovely burst of fresh veggies. Beef stock adds lots of liquid to the pot so that it can simmer gently for about an hour and a half. You can use any type of potato that you like (try sweet potato for a Paleo version of the recipe!). 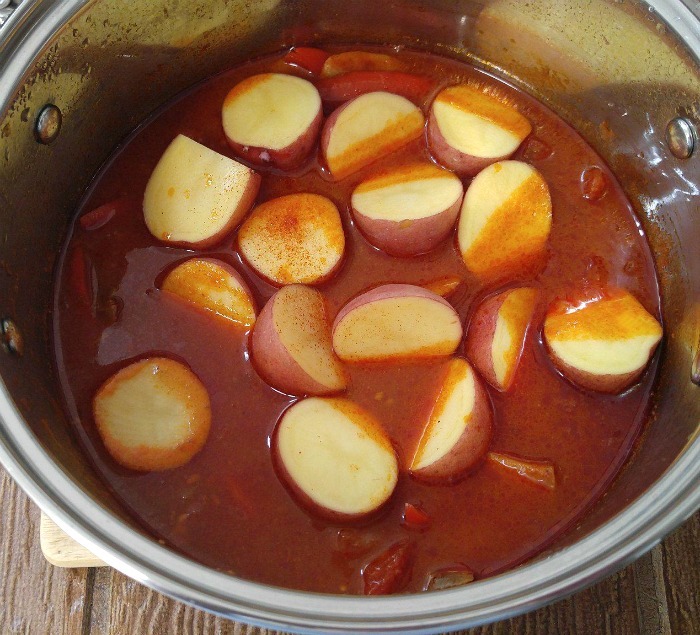 I had small red skinned potatoes so I cut them into pieces and added them to the goulash for an additional 30 minutes. Once the potatoes were tender, I combined the arrowroot powder with 1/4 cup of beef stock and stirred it in to thicken the sauce. Tasting this one pot Whole30 Beef stew. The flavor of this easy beef goulash is bold but still simple. I love using thick chunks of beef instead of taking the easy way with ground beef for an extra special touch. The sauce is rich and tasty with a spicy kick without too much heat. 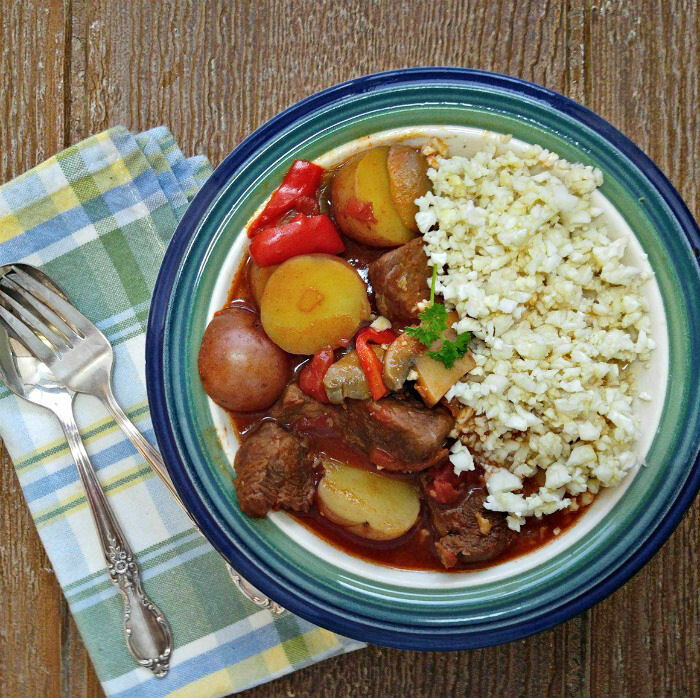 I served this delicious one pot goulash over some cauliflower rice. It gives a bit more of a presentation to the dish and also gives that amazing sauce a place to go after the big bits are gone! The recipe gives three hearty servings at 368 calories each. 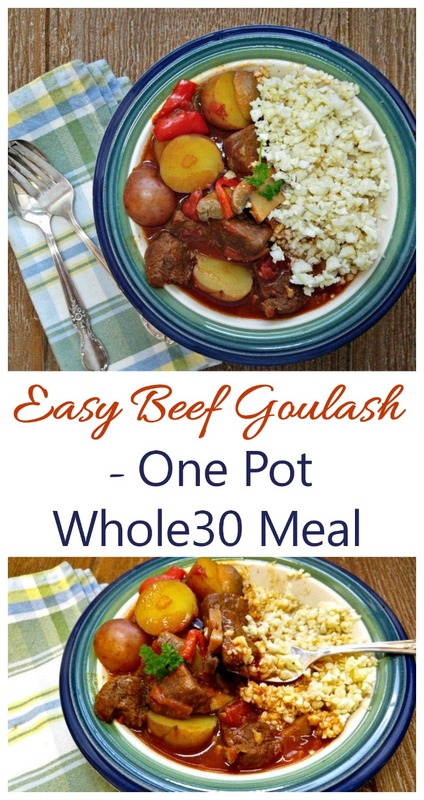 Try this delicious Whole30 beef goulash today! For another great comfort food recipe be sure to try this one pot chicken and barley stew. The flavor is to die for! 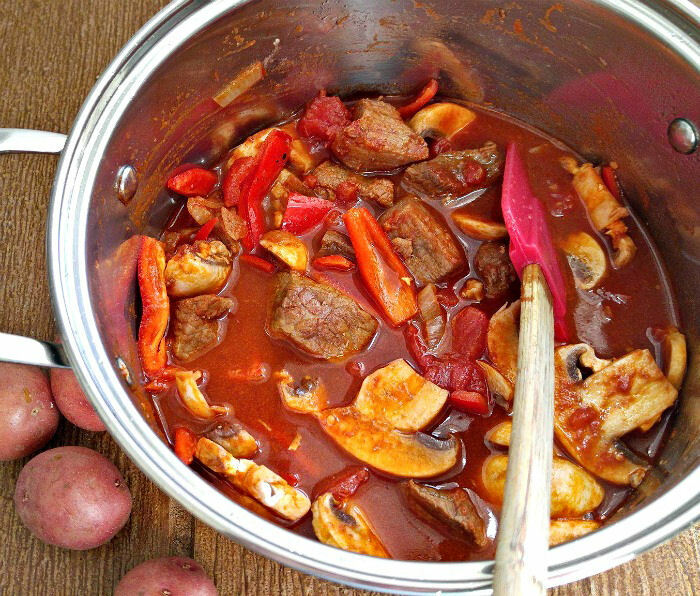 This easy beef goulash is a one pot Whole30 Beef stew with cubes of beef, red bell peppers, sliced mushrooms and onions in a rich tomato paprika sauce. Heat the coconut oil over medium high heat in a large saucepan. Add the onion and cook for about 1 minute until it is starting to soften. Stir in the beef cubes and minced garlic and cook for about 3 minutes until the beef is lightly browned. Lower the heat to medium and stir in the paprika, canned tomatoes and tomato paste. Cook a minute and then add the mushrooms, peppers and 1 13/4 cups of beef stock. Bring the mixture to a a boil and then lower the heat, cover and simmer gently for 1 1/2 hours until the meat is tender. Add the tomatoes and cook for 20-30 minutes until tender. Blend the cornstarch with 1/4 cup of beef stock and add to the pan, stirring until the sauce is rich and thick. Season again with salt and pepper to taste and serve immediately.